There is something magical about finding that stocking on Christmas morning. You can tell from across the room that it is stuffed with surprises and treats. The memorable moment starts weeks before with a search for stocking ideas. What will your elves love to discover? As stocking ideas go, what chocolate treats will light up their eyes? Certainly, a rather famous reindeer is a good start. 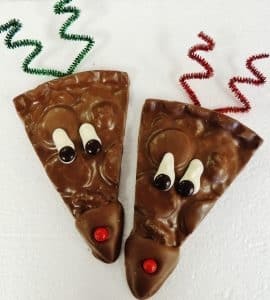 Chocolate Pizza Company’s Reindeer Slice tops the list of stocking ideas. Delicious milk chocolate blended with homemade toffee is hand-decorated. The expressive eyes, the red nose and sparkling antlers complete a one-of-a-kind Christmas surprise. Not surprisingly, the Elf Pack is a close second in stocking ideas for your little Elves. It is the cute handled tote that gets their attention first. There is a variety of seasonal designs but each is cute and fun. But it is what’s inside that hits a home-run. Chocolate covered rice crispy square, mini Chocolate Pizza and chocolate covered cookie are a trifecta of treats. However, cookies are Santa’s calling card. 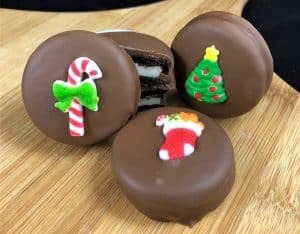 Stocking ideas must include some cookies and Chocolate Pizza Company has some gems. Chocolatiers take America’s favorite vanilla-cream cookie and cover it in rich milk chocolate. But to finish the look, they add a festive sugar decoration. Elves of all sizes will delight in finding more than few of these in their stocking. Of course, for the “big” kids, there is always our famous Peanut Butter Wings. Potato chips with deep, crisp ripples are covered in creamy peanut butter then drenched in chocolate. It is a salty-sweet masterpiece. The crunch of the chip, the salty peanut flavor and the sweet finish of gourmet chocolate create confectionery gold. Glitter magazine raves, “You have not lived until you’ve tried these.” There is nothing like Peanut Butter Wings anywhere – even the north pole. 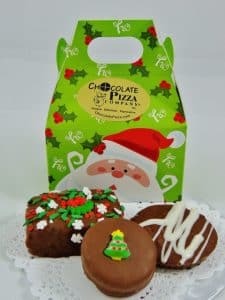 Santa loves to shop Chocolate Pizza Company for this unique holiday hit. Mamma’s stocking deserves a little something special. The Peppermint Blizzard Slice is the perfect way to treat mom. Instead of toffee, chocolatiers blend crushed candy cane with decadent dark chocolate. White chocolate is drizzled heavily across the 6 ounce Slice. Finally, it is topped with more crushed candy cane. The result, the peppermint aroma and taste take the dark chocolate to new heights. Mom will know Santa had her in mind when she sees the Blizzard Slice in here stocking. 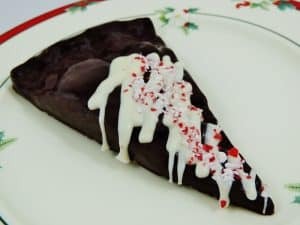 Chocolate Pizza Company has been helping Santa for 30 years. The company’s signature gift, Chocolate Pizza, is great for business or families. Chocolate Pizza blends gourmet chocolate with homemade English toffee. The mixture is topped with a variety of candies or nuts. It comes served in custom pizza box. Owner, Ryan Novak, started as a dishwasher at age 15. He became the owner when he turned 21. Since then, Ryan has transformed Chocolate Pizza Company into Central New York’s largest chocolate maker. Chocolate Pizza Company has been featured on Hallmark Channel, Food Network, CNBC and CMT. Forbes magazine, People magazine and Entrepreneur magazine have all covered Ryan. Chances are good that even the North Pole has heard of this chocolatier. However, you can view all the incredible holiday gift ideas on their website, ChocolatePizza.com.